We’d love your help. Let us know what’s wrong with this preview of The Tailor-King by Anthony Arthur. He was only a Dutch tailor's apprentice, but from 1534 to 1535, Jan van Leyden led a radical sect of persecuted Anabaptists to repeated triumphs over the combined powers of church and state. Revered by his followers as the new David, the charismatic young leader pronounced the northern German city of Muenster a new Zion and crowned himself king. He expropriated all private He was only a Dutch tailor's apprentice, but from 1534 to 1535, Jan van Leyden led a radical sect of persecuted Anabaptists to repeated triumphs over the combined powers of church and state. Revered by his followers as the new David, the charismatic young leader pronounced the northern German city of Muenster a new Zion and crowned himself king. He expropriated all private property, took sixteen wives (supposedly emulating the biblical patriarchs), and in a deadly reign of terror, executed all who opposed him. As the long siege of Muenster resulted in starvation, thousands fled Jan's deadly kingdom while others waited behind the double walls and moats for the apocalyptic final attack by the Prince-Bishop's hired armies, supported by all the rulers of Europe. With the sudden rise to power of a compelling personality and the resulting violent threat to ordered society, Jan van Leyden's distant story strangely echoes the many tragedies of the twentieth century. More than just a fascinating human drama from the past, The Tailor-King also offers insight into our own troubled times. To ask other readers questions about The Tailor-King, please sign up. Read this back in the year 2000. Thanks to this post from the Marginal Mennonite Society I gained access to the following excerpt. The following is excerpted from The Tailor-King: The Rise & Fall of the Anabaptist Kingdom of Munster by Anthony Arthur (St. Martin’s Press, 1999), pp. 78-82. “As Jan van Leyden’s grip on the city of Munster tightened, Bishop von Waldeck’s army prepared for its first assault. In March his military engineers had recommended draining the outer moat to allow the stor Read this back in the year 2000. Thanks to this post from the Marginal Mennonite Society I gained access to the following excerpt. 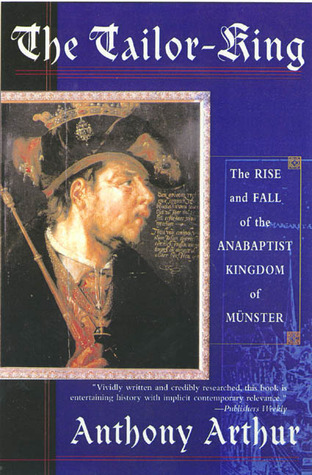 The following is excerpted from The Tailor-King: The Rise & Fall of the Anabaptist Kingdom of Munster by Anthony Arthur (St. Martin’s Press, 1999), pp. 78-82. “As Jan van Leyden’s grip on the city of Munster tightened, Bishop von Waldeck’s army prepared for its first assault. In March his military engineers had recommended draining the outer moat to allow the storming of the outer wall by the Judefelder Gate and the taking of the ‘roundel,’ or tower, that supported it. Von Waldeck wanted to begin the digging immediately, but had to assign several hundred men to defend his powder magazine in Wolbeck. A recent rebel assault on the village suggested that the storehouse there was in danger, and its loss would leave him without the means to continue the siege. Digging finally did commence on April 29, with a company of Saxon miners directing the efforts of 300 farmers every night for a week. “The moat before the Judefelder Gate had been selected because the city, despite appearances, was not perfectly flat. The elevation there was about 8 feet higher than elsewhere, meaning the moat, fed by the river Aa, was shallow enough to allow a drainage ditch to divert the flow temporarily and expose the bottom. This was a major engineering effort. Moreover, it had to be done under the guns of the defenders, which meant work was limited to the cover of night. After a week it was apparent that more men were needed. The Bishop requested help from his neighbors, and 2,000 additional farmers were forced to leave their spring planting to dig the Bishop’s drainage ditch. “They were sure, the Elders said, that a solution could be reached once the princes realized whom they were fighting and why. The questions now were where they should meet -- how far from the city gates? -- and what solutions were to be suggested. The commanders’ written response was requested, and they were enjoined to ‘fear God and honor Him.’ There is no record of a response. A second message, sent directly to the Bishop, closed the door on further talks: ‘Because the truth can never be known on earth, we are content to let God who dwells in heaven be our judge. “On Friday, May 22, the attack began in earnest. For each of the next four days, 35 cannons would each lob 20 shells per day toward the city’s gate towers and defensive walls, a total of 700 cannonballs made of stone and iron a day -- it was impossible for any defensive positions to withstand such a barrage, the Bishop’s commanders said. In Telgte, 12 heavy wagons and 100 horses were gathered to carry munitions, grappling hooks, and 85 storming ladders to the battle site. The foot soldiers who would take the walls after the bombardment (for double their usual pay) were backed up by the cavalry, which would drive through the gates once they were opened. “On the afternoon of May 25, before the attack scheduled for the following dawn, soldiers readied huge bundles of straw, to be placed after dark over the spongy earth of the drained area of the moat. The soldiers would pass easily over these mats to attack the now vulnerable outer wall. “The Bishop was so confident of his plan’s success, wrote Philip of Hesse to the King of Denmark, that he was sure he could release all of his soldiers within two weeks. The defenders, to be sure, were not idle. Teams of women assembled heaps of earth and manure to patch the holes in the walls that enemy canon would create. The old men and boys in the fire brigades practiced passing leather buckets of water to smother the flames started by burning arrows shot over the walls. Hundreds of armed men patrolled the walls and waited by their cannons at each of the 10 city gates. But the men capable of battle were hugely outnumbered by a professional army that had been preparing for months for an attack. As the sun began to set on the evening of May 25 and his troops gathered themselves in readiness for the coming attack, the Bishop’s optimism seems to be well founded. “It was severely shaken when he sat down at the end of the next day to write a report to Philip of Hesse. Because of a few drunken soldiers, he said, the attack had been a disaster. The soldiers had begun drinking early in the afternoon of May 25, it appeared, then had lapsed into an alcoholic stupor. On awakening they saw the thin edge of the sun on the horizon -- they had slept through the night, they told each other with alarm, and the designated moment of attack had arrived! The soldiers, still drunk, raced through the camp crying ‘Charge!’ Before the commanders could intervene, an attack was in full swing, uncoordinated and unled, other than by half a dozen drunks who could not distinguish between a sun setting in the west and one rising in the east. Stumbling into the swampy moat, where there had not yet been time to place the straw mats, the soldiers were easy targets for the alerted defenders. Two hundred died or were wounded in the short battle that ensued. The Anabaptist shopkeepers suffered virtually no casualties, and the city’s reputation as an unconquerable citadel under God’s protection received a healthy boost. The soldiers, thoroughly humiliated, were ‘beginning to be rebellious,’ wrote von Waldeck. “The incompetent attempts of the Bishop to destroy the Anabaptists were a dramatic contrast to the military order and imagination that had so far marked their resistance. Jan van Leyden clearly had a talent for psychological warfare. His taunting of the Bishop and his men humiliated them and endeared him to his followers, who could now see the justification for his stringent discipline. Religious enthusiasm, however, was by definition hard to control. Even as it made the Anabaptists so difficult to conquer, it sometimes led them into disaster. On the same evening as the Bishop’s misbegotten assault, a chimney sweeper called Wilhelm Bast received his own vision: he was to go forth and burn everything he could within the Bishop’s realm, beginning with the powder storehouse in Wolbeck. He was captured soon after setting a few huts ablaze and condemned to die by fire in the most painful manner conceivable. Wood was piled around an iron post, at the top of which was a short chain, a few feet long, on a swivel. The victim’s wrist was secured to the chain and the fire was lighted. He had enough room to run around the fire, but not enough to escape being slowly roasted alive. Historical events explained in a gripping easily digestible narrative. A story from the middle ages with parallels to modern conflict and despotic rulers. Forensically written and researched . I knew nothing of the siege of Munster or Jan Van Leyden until I read Wolf Trial a fiction Novel by Neil Mackay (also excellent imho). This sparked my interest to learn more about the actual events. I was not disappointed. Arthur breaks down a complex ( well for me anyway ) historical episode and its main c Historical events explained in a gripping easily digestible narrative. The truth, as they say, is stranger than fiction. The story has everything you'd expect from a good drama, and nothing you'd expect from a non-fiction book about an obscure religious sect. Murder, brainwashing, treason, psychopathy, sacrifice, siege, torture, lust, greed, you name it. Worth the quick read, despite the confusing mass of similar-sounding names. A well researched and passably written account of a fascinating event, only misses a 5th star for failing to expand on the personalities involved - forgivable for the obscure burghers on the Anabaptist side but not certainly in the case of Franz von Waldeck and his allies. Incredible story, fairly average book. It's the reformation and religious and social tumult is rolling across Europe. As if those Lutherans weren't crazy enough, along come the Anabaptists. The Anabaptists don't believe in infant baptism. They also have a millenarian streak. They are persecuted throughout Europe. In the walled city-state of Muenster, in present day Germany, Anabaptist ideas have taken hold among some of the population. Anabaptists live alongside Lutherans and Catholics. The Anabaptists and the Lutherans band together and kick out the Catholics. Then slowly the Anabaptists take over and boot out the Lutherans. The anabaptists, led be some charismatic individuals are under siege from the Bishop outside the walls, who isn't really a religious leader so much as the powerful guy who represents the status quo. The anabaptists believe they are creating God's kingdom on earth. They abolish private property. They institute polygamy. They start burning books and encouraging kids to rat out their parents. They start executing people. They hold out for quite awhile against the Bishop outside the walls. This is a fantastic book detailing the life of the Anabaptists around Munster in the 1530's. Talks about how the Anabaptist extremists took control of the city and the siege that held them in ultimately resulting in their demise. The amount of cruelty, by today's standards, is mind blowing. A fascinating read on how a simple intellectual contagion can cause so much destruction. In the early sixteenth century, the German city of Münster was seized and held for a year by violent psychopathic Anabaptists. If that wasn't a hell of a story already, Arthur brings it to life in grisly Technicolor. Highly recommended. Excellent account of the Muenster Anabaptist cult uprising. One of most engaging historical accounts I've ever read. Truly reads like a novel.